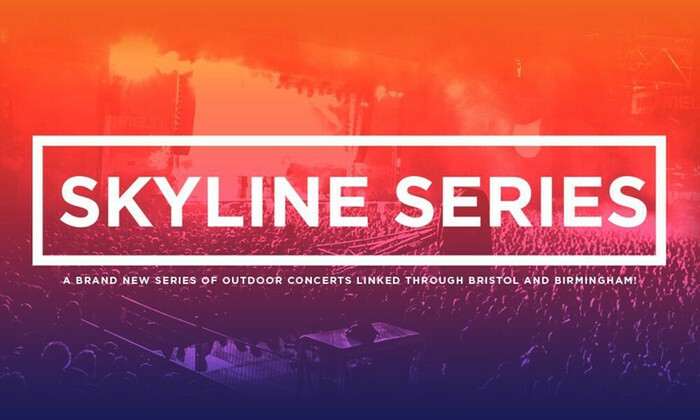 It’s a pure case of balmy Friday night splendour as the first instalment of the newly introduced Skyline Series plays host to a nostalgia inducing triumvirate of Peter Hook & The Light, The Jesus & Mary Chain and Echo & the Bunnymen. The fact that tonight’s original venue – the new outdoor arena of St Philip’s Gate – is yet ready for action is, in the circumstances a happy one. The scenic harbourside backdrop provided by the Lloyds Amphitheatre is close to perfect on gorgeous summer’s evenings such as this. Arriving after Peter Hook & The Light’s set, focus is very much on two of the heavyweights of the post-punk, new-wave era. The Jesus & Mary Chain are halfway through their set as I make my way into the large-but-hardly-close-to-a-sold-out audience. Amidst a generally middle-aged crowd and a panoply of band T-shirts of the era – including The Cure, The Fall, The Smiths – there is something fairly modern emerging from the stage; ‘All Things Pass’ from 2017s Damage and Joy is less engulfed in the band’s trademark fizz and emanates clearly, though a little tepidly, from the stage. Though the band are effortlessly watertight, the sound emanating from the stage isn’t near big enough to envelope us all in its intoxicating fuzz and there’s little extra stage activity – be it movement or badinage – to increase the levels of interest. ‘I Hate Rock n Roll’, however, is a strong closer. It’s a set that feels a tad raw – the adroit delivery of quality songs combining with breakdowns and flat receptions to new material. To give them their due, the new songs we hear are decent enough but McCulloch – apparently inspired by the audience’s indifference – sarcastically remarks “it’s a classic” when introducing the second of these. ‘All My Colours Turn to Clouds’ is halted after suffering a mid-song stumble and McCulloch’s ostensible justification – due to his thick Scouse rumble – is totally lost in the ether. As opposed to the wheels coming off, a series of favourites towards the home straight sees the set regain its momentum. ‘Never Stop’, the evening’s most quintessentially 80s tune, is clearly a crowd pleaser and the anthemic ‘Bring on the Dancing Horses’ incites perhaps the most spirited audience singalong of the evening. Returning for a one song encore, it’s the utterly predictable but equally welcome rendition of the band’s 1984 magnum opus ‘The Killing Moon.’ McCulloch incredibly is still smoking and doesn’t appear to have ceased for the entire set. The raga guitar lines and McCulloch’s vocal refrain at the song’s outro sound just like the record. It’s a magical moment and perhaps enough to quell suspicions that the evening occasionally felt like a pointless excercise in nostalgia. Tagged bristol, echo and the bunnymen, Gig review, scott hammond, skyline series, the jesus and mary chain. Bookmark the permalink.